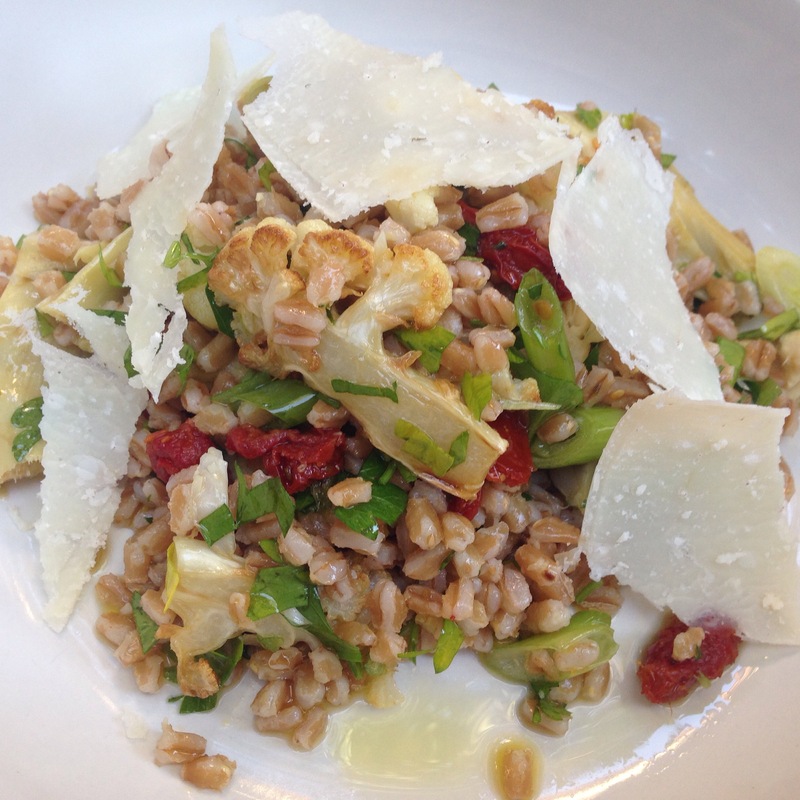 Since the weather is still so warm here it’s refreshing to eat cool foods–like this farro salad! You can make a big batch and eat it throughout the week, use it for football Sunday for a healthy alternative to feed a big crew, or just enjoy it on your terrace or patio without sweating your face off. If you prefer, you can also serve this warm! Also, if you’re a newbie to farro check out this link to learn more about it! Cook your farro and let it cool. You can even do this the night before. Mix with some evoo so that it doesn’t stick together. Season with salt. In a pan, heat some olive oil over medium-high heat and place cauliflower so that one side browns. Once browned, carefully flip each slice of cauliflower and brown the other side. Once browned on both sides, add garlic and artichoke hearts cook for approximately 5 minutes. Remove from heat and pan and place in a refrigerated metal bowl to cool. Once cooled (even if it’s still a little warm it is ok) combine with the farro and mix well. Be careful not to break your cauliflower slices. Add the sun-dried tomatoes. Add the scallion and parsley and season with salt/pepper to taste. Season liberally with evoo. Top with the shaved parmesan slices and enjoy!